The 7th Leadership Initiative in Science Education (LISE 7) is one of an ongoing series of national science-education conferences that have been held at the Chemical Heritage Foundation annually since 2000. 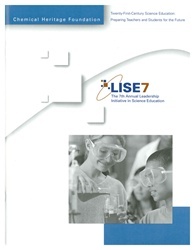 LISE 7 presented multiple perspectives on how to be prepared for 21st-century science education. In attendance were leaders from industry, colleges and universities, education, science and technology museums and learning centers, and national and regional organizations. Contents: Introduction; Critical Challenges; Cutting-Edge Concepts; Digital Natives; Using Technology to Educate; Teaching in the New Learning Environment; Executive Summary; Acknowledgments; Schedule of Events; and Speaker Biographies.